Banana + Toffee = Banoffee Pie! When I was young, my dad used to call me a little monkey. Partly, he liked to tease me because I was born with a thick head of dark hair (which fell out and grew in blonde), and partly because I LOVED bananas! Apparently I was obsessed with them and would repeatedly dance like a monkey and chant, “nana, nana, nana” until I was fed one. Well, perhaps because I ate so many as a baby, I went off bananas for much of my life. And I suffered from many a cramp in my youth – likely as a result of some potassium deficiency. When I lived in England, I worked at a trade show that was catered by a very talented chef who worked in a restaurant in Oxford. Now this was over ten years ago and I am sorry that I can’t remember her name. However, she introduced me to pesto rice (just stir your favourite pesto into warm rice and then enjoy hot or cold!) and BANOFFEE PIE! I was hesitant to try it because I really didn’t like bananas and hated banana flavour in anything. But everyone else who tried this dessert raved so much about the recipe, I had to give it a go. It was worth the risk. The banana and cream cut the sweetness from the caramelized condensed milk. It was pretty awesome. And assuming you have some time, it is very easy to make! I didn’t remember her crust recipe so I decided to use my handy, dandy, graham cracker crust favourite sans sugar as this is sweet enough already. The rest of the pie assembly is so easy you will never forget it; layer in the toffee, sliced banana and top with whipped cream. 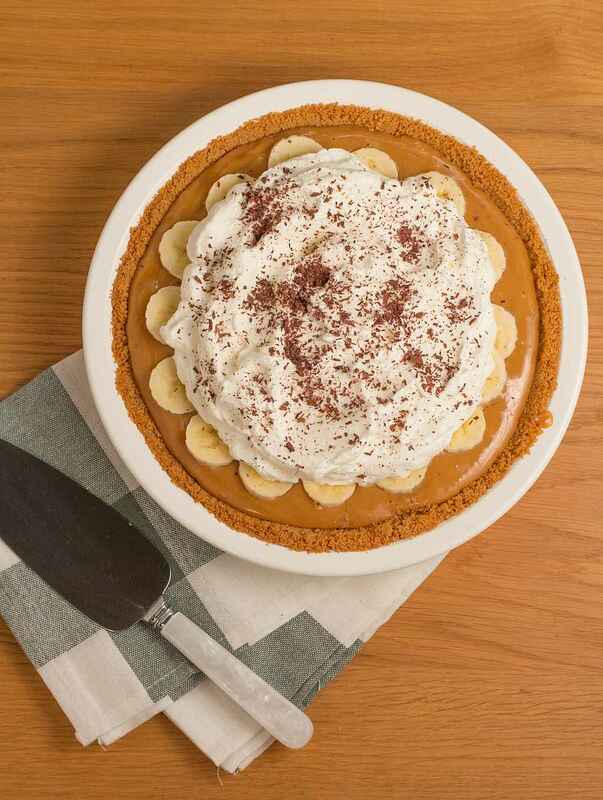 For the specifics of this Amazing Banoffee pie recipe, please check out ProduceMadeSimple.ca with whom I was happy to share with for their “banana week”. Thanks also to the The Viet Vegan who took this awesome photo of my banoffee pie! Because she’s vegan, she didn’t eat any, but as soon as the photos were done, I sure did! If you want to learn how to make your own Dulce le Leche without the cans exploding, read my tips below! Home Made Dulce le Leche! Buy two or three cans of condensed milk in the 300 mL can size. Despite the manufacturer’s warning, “DO NOT HEAT IN CAN”, you need to simmer the cans of condensed milk for 2 to 3 hours. Be patient with this. The longer you cook the cans, the thicker and darker the “toffee” for your “banoffee” will be. I sort of freaked the first time I did this because I thought the cans would explode but it turned out just fine. However, you must keep an eye on the water level and make SURE THAT THE CANS ARE TOTALLY SUBMERGED IN WATER AT ALL TIMES. Have a boiled kettle ready and top up the water as needed. Finally, keep the water at a simmer (not a rolling boil). Also I suggest you turn the cans on their side when they are boiling to stop them from “rocking and rolling”. Otherwise, this noise is sure to drive you crazy – especially as it would go on for 2 to 3 hours! 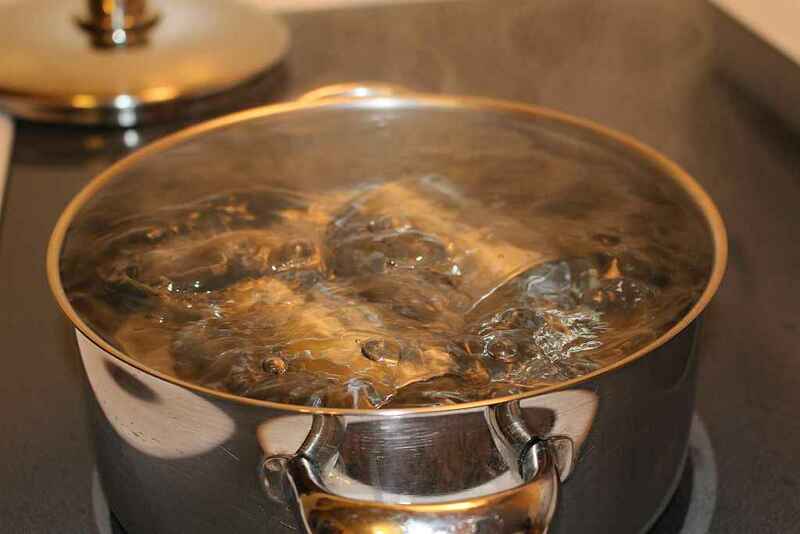 After a minimum of 2 hours, turn off the heat, go to bed and leave it overnight to cool. Even though the banoffee pie recipe only calls for one can of prepared condensed milk, I recommend that you simmer two or three at the same time. Keep the others for months, unopened in the cupboard – to use quickly for another pie or over ice cream. 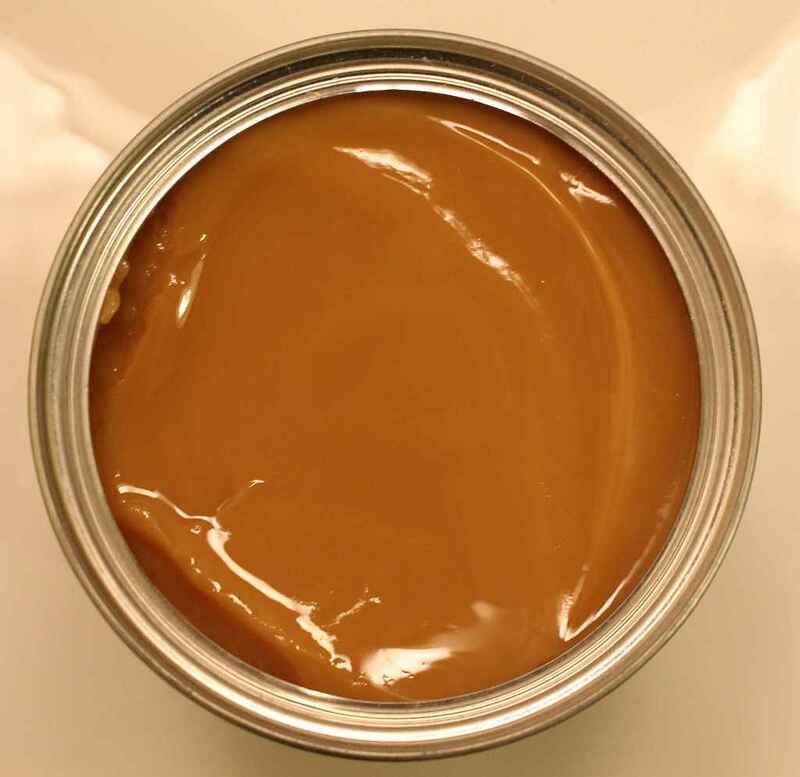 If you don’t have the time, or don’t have the nerve to boil cans unopened – the other option is to buy store bought Dulce le Leche. To my knowledge, there is a President’s Choice option in Loblaws stores, as well as an Eagle Brand version. However, my favourite is still the one I make myself!